The conclusion chapter brings together the insights gained through the exploration of the multiple forces, drivers and actors that have been shaping European policy in the area of higher education. The global tendencies towards liberalisation of markets and neoliberal thinking have influenced the rhetoric about higher education and its purposes. European Union institutions, too, have facilitated this new direction for higher education, seen as an engine of the continent’s economic growth. 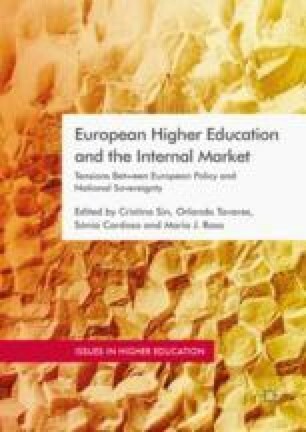 Although not explicit in European policy, the invisible hand of the market is becoming more and more visible in European higher education, exerting pressure through the intervention of European institutions in areas not immediately and obviously related to higher education. National sovereignty, evident in the implementation of the Bologna Process, has represented an obstacle to the pursuit of this economic agenda. Schäfer, A. (2004). Beyond the Community Method: Why the Open Method of Coordination was Introduced to EU Policy-making. European Integration Online Papers, 8(13), 1–19. http://eiop.or.at/eiop/pdf/2004-013.pdf. Sin, C., Tavares, O., & Amaral, A. (2017). Accepting Employability as a Purpose of Higher Education? Academics’ Perceptions and Practices. Studies in Higher Education, 1–12. https://doi.org/10.1080/03075079.2017.1402174.